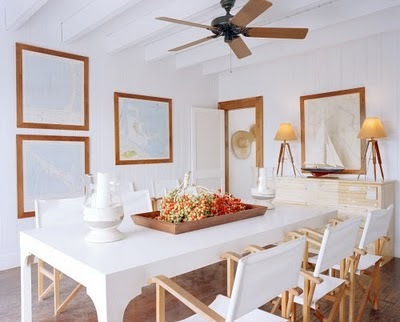 Heather Clawson from Habitually Chic posted these photos of India Hick's residence in Harbour Island in the Bahamas this week and it instantly put me in a good mood. How could you not want to live here? The clean white panelling paired with rich wood accents, natural floor coverings and lots of airy white and island decor? Heaven! 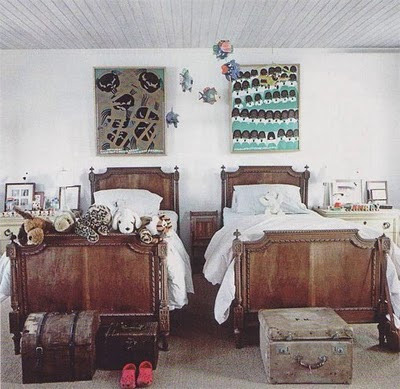 The boys' rooms are simple and charming. The antique twin beds & large artistic prints take center stage and you can see there is no need for pattern or throw pillows to make this room interesting. This second photo below is my favorite, as it reflects real life with boys. I'd love a photo like that for my profile shot...hmmm. And this dining room, I'd eat, read, and have a cocktail or two here with friends all day! 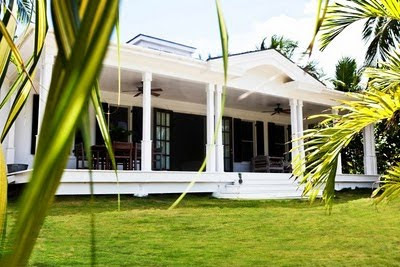 If you want to live the India Hicks life as I do, this and most of her properties are available for rent! Where did you get the boys beds?